‘White Fairy’ is almost certainly a white form of the ‘Dwarf Pink China’, the ‘Fairy Rose’, possibly the variety pallida or alba and almost certainly synonymous with Paul’s variety alba or Blanc, in his group of Lawrenceana or Fairy Roses. [Paul (1848, 1863, 1888, 1903)]. ‘Our present subject [Rosa semperflorens minima, ‘Miss Lawrence’s Rose’] is the most dwarfish Rose that has ever fallen under our notice, rarely producing any branches, so large as represented in our plate.’ [BM t.1762/1815]. The history of these roses is uncertain. Dr. C. C. Hurst wrote that in 1805, at Colville's nursery in England, ‘Parson's Pink’ gave rise to the ‘Dwarf Pink China’, a miniature rose known in England as the ‘Fairy Rose’ or ‘Rosa Lawrenceana’. Catherine Gore, on the other hand stated that ‘these roses, natives of the Isle of Bourbon, where they were obtained by cultivation, or perhaps from China, differ from the Semperflorens, or common China rose, chiefly in their diminutive proportions.’ Rivers claims they were introduced from China in 1810, being ‘nothing but a dwarf seminal variety of the common china Rose.’ [Rivers (1854, 1857, 1863)]. 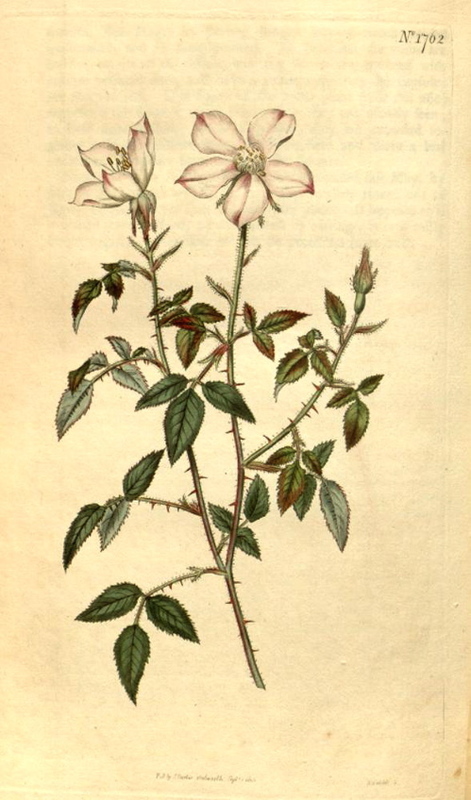 Rivers considered that ‘Pallida is the only variety [of Rosa Lawrenceana, the Miniature Rose] approaching to white. Its flowers, when they first open, are nearly of pure white, but they soon change to a pale flesh colour; this is rather a delicate rose, seeming very impatient of cold and damp.’ The Floricultural Cabinet considered the name very appropriate: ‘Some of these are known as “fairy roses” and they indeed deserve the appellation; they are exceedingly well adapted for planting on Rockwork.’ [FC p.272/1836]. This rose is listed on a hand written page - 18(a) - in an 1850 catalogue held at the Mitchell Library [ML 635.9m], appearing in printed form in 1857 [T.909/1857].